The popularity of WORLD among homeschoolers probably isn’t a coincidence. One factor here is staff overlap: WORLD’s longtime (now former) culture editor, Gene Edward Veith, is the Provost of the HSLDA-funded Patrick Henry College, founded by Michael Farris — who also founded HSLDA. WORLD’s editor-in-chief, Marvin Olasky, is the Distinguished Chair in Journalism and Public Policy at Patrick Henry College. And Les Sillars, the current Mailbag Editor at WORLD, is also (currently) Patrick Henry College’s Professor of Journalism. At least a few WORLD magazine writers have been fans of Vision Forum, attending major Vision Forum events, etc. … WORLD magazine published an article by Doug Phillips in 1998. Also in 1998 WORLD magazine also praised one of Phillips’ books and spoke positively of Vision Forum’s publishing wing. … WORLD Magazine…promote[d] the recent patriarchal Vision Forum—related movie Courageous up and down. If WORLD magazine is serious about having nothing to do with the patriarchy movement, they need to be more proactive and less ambiguous. If WORLD is serious about having nothing to do with the patriarchy movement, they need to be more proactive and less ambiguous. That’s the same criticism we’re hearing about Patrick Henry College’s chancellor, Michael Farris, who gave a tepid and responsibility-shirking criticism of “Christian Patriarchy” in World Net Daily and also recently “critiqued” it via insulting LGBT* and atheist homeschool alumni. Of course, WORLD has started covering several of the recent scandals within Christian homeschooling — including Bill Gothard being placed on administrative leave, resigning, and the charges against him; as well as the fall of Vision Forum and the sexual assault lawsuit against Vision Forum’s Doug Phillips. Yet in their just-published “2014 Books Issue,” it appears that money speaks louder than principles. Because just like HSLDA continued to receive ad revenue from promoting Vision Forum in Michael Farris’s official HSLDA emails (while claiming it was trying “to keep this stuff outside the mainstream of the homeschooling movement”), WORLD Magazine covers the crumbling public face of Christian Patriarchy all while taking its money to promote it in full page ads. In WORLD’s most recent print edition, the magazine features two full page ads for the biggest names in Christian Patriarchy. 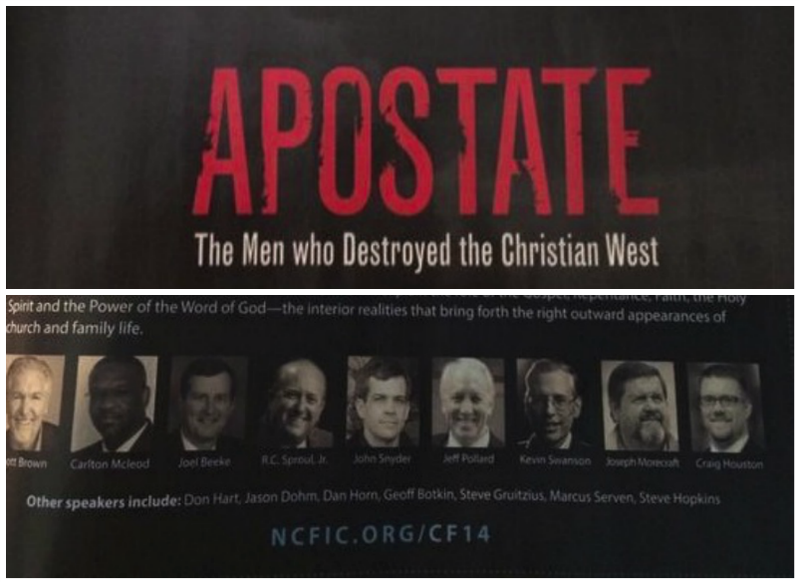 The first is for Kevin Swanson’s new (and academically embarrassing) book “Apostate.” The second is for a NCFIC (National Center for Family Integrated Churches) conference featuring Christian Patarichy celebrities like Scott Brown, R.C. Sproul, Jr. Kevin Swanson, and Geoff Botkin. Not to mention that many WORLD subscribers are conservative Catholics and one of the “Apostates” that Kevin Swanson believes helped usher in the end of Christianity is Thomas Aquinas. Yes, like the classic Christian theologian Thomas Aquinas. But despite Aquinas being Evil Incarnate to Swanson, Aquinas’s face is absent from Swanson’s WORLD ad. Pretty convenient, right? Ultimately, money makes the world go round, and that’s evidently no less true for Christian magazines. Considering that full page ads are $5,600 each, Christian Patriarchy just made WORLD $11,200 richer this month. And WORLD just brought Kevin Swanson and NCFIC into the homes of 100,000 families. Wink, nod, shhh. I’m surprised Swanson is still slated to speak at the conference considering NCFIC has taken his church off their rolls. I’m thinking that the ad was submitted before his presbytery made him sever ties.